The Bigfork Valley Community Foundation has several capital campaign projects underway that are intended to enrich our communities. If you are interested in giving to any of our special projects please see the mail-in form or donate online at our secure PayPal page where you can quickly and easily fill in the amount you would like to donate. The Bigfork Valley Community Foundation, Northern Itasca Joint Powers Board, City of Bigfork, Bigfork Valley Hospital and other local stakeholders are collaborating on the development of a multi-use trail in Bigfork that will parallel and highlight sections of the Bigfork and Rice Rivers. The trail will provide a unique connection between Bigfork businesses, residents, visitors, Bigfork School, Bigfork Valley Health Care Campus, City of Bigfork amenities, and recreation facilities. 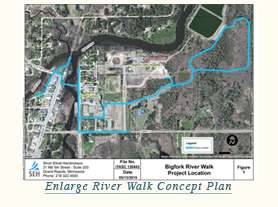 The purpose of the trail is to provide pedestrians, bicyclists, rollerbladers, and other users a non-motorized transportation route throughout the City of Bigfork. Once completed, the trail will be a terrific asset in improving peoples’ health and wellness and will be an option for physical exercise. Bigfork School will utilize the trail for athletic training and physical education classes. Bigfork Valley Hospital, Clinic, and Communities will utilize the trail for its patients, residents, and staff. The trail will serve as an additional attraction within the City of Bigfork and Edge of the Wilderness area. It will be used for recruiting new residents and visitors to the area which in turn will benefit the entire community in a variety of ways. The majority of the trail will be constructed to be handicapped accessible. The trail will be completed in the summer of 2016 but we still will be seeking funding for a new foot bridge over the Rice River.